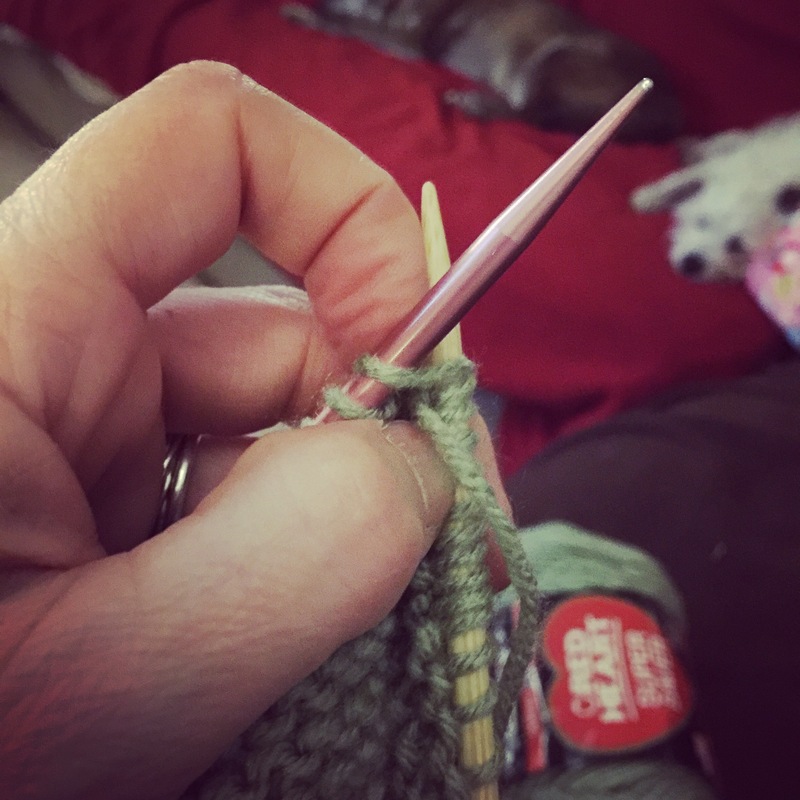 Yesterday I had my Knit-it level 2 class where I learned how to yarn over (yo) and knit two together (k2tog), successfully I might add. Then when I got home, I decided to see if I could transfer needles, from the straight needle on to a circular bamboo one, and I was pretty successful at that too. The circular needle is great for this large project I’m working on and the bamboo almost seems easier to work with, but I’m not sure how to explain that. Maybe because it’s a wood and is warming to my hands as opposed to a cold metal? And the bamboo doesn’t make a clinking sound like the metal does? Now I just sound like a hyper sensitive crazy woman. Anyway, it was a good day. There was a lady and her daughter in class, and the lady – Loraina – was having a little difficulty and she told teacher that she was getting stressed. I said “Loraina, there’s no stress in knitting class. No stress”. She laughed. I think it helped. Think about it, really: anything you do in knitting class can be taken apart and you can start over. It’s very simple and not a big deal, really. So there shouldn’t be any stress. Besides, knitting is the new thing to make and create and help relieve stress. Sewing and making jewelry is also a stress reliever for me. Gardening too. And yoga. Most creative things and nature make me happy. And my dogs. And kittens. And farm animals. I just need to win the lottery so I can do all these things and be totally stress free, amirite? Hope you are stress free today. My mom is a crochet-er, she doesn’t care for knitting but I am thoroughly enjoying it! The metal needles are an inheritance from my grandmother when she died. Grandma had some awesome stuff. Glad you are enjoying it!